Although, your technique is nothing new as far as the fractal world goes (what is, really? ), it does the job, and well. You did great in representing your concept, which is further enhanced by your title. I'm not sure how I should rate Vision because I don't know what exactly your thought process was while you made this fractal, but I'm going to assume that you had a fairly good idea as to what you were going for. Once again, a fantastic and rewarding UF work. You've made a lot of progress with the program and I wait in anticipation of more. I don't know how critical this critique will be, since I think this is easily one of your best fractals, and definitely the best of the disk plasmas. I think the main thing that gives it such an impact (besides looking like the beach, of course) is the balance of light and dark colors. You definitely got that spot on. Near-flawless composition helps, too. I say "near" because now that I think about it, the fractal could have been scooted a skosh to the left. There! There is my obligatory critique suggestion. It will probably be the only one I can think of, so... time to gush about the textures for a little while! Because seriously... I remember you posting some in-progress params for this asking for texturing help, and I am SO damn glad you didn't take my advice. This is WAY better than whatever I ponged back at you. I love the sand texture especially. I'm looking at it in download view right now and the way it interacts with the swoopy plasma lines is awesome. The wave texture is perhaps a bit visually monotonous (holy crap, a second piece of critique! ) but I suspect that is only in comparison with the sand texture. Also, I guess it fits with waves/water/seafoam anyway. Last but not least, the dividing line of white between the waves and the sand is extraordinarily well executed. I appreciated it before but now that I am seeing it in download view it just might be my favorite part of this fractal. I'm having a hard time articulating why though... it's just... the undulating shapes, both on a small and large scale, in addition to the way it appears smoothly and translucently brushed on... it's visually appealing in it's own right, but especially appropriate for the meeting of shore and sea. Can't really think of a good way to conclude this. Hopefully everything up to this point speaks for itself. ~ ~ Planet's Top Fractalist! Congratulations on yr big win with this. Great work. You must be seriously blown away. Oh Wow, This is just Gorgeous ! My favorite Complimentry Colors....I cannot believe its a Fractal, it looks like a Beautiful Hand Drawn Piece of Fine Art ! Easily one of the best pieces of art in the fractal gallery as of late. Very cool, reminds me of the beach. 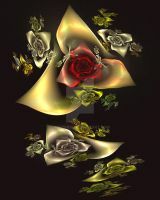 Very funky and sleak abstract shapes, combined with nice colors it creates a nice piece. wow!!!! this looks so cool. Looks exactly like a beach with sandcastles.